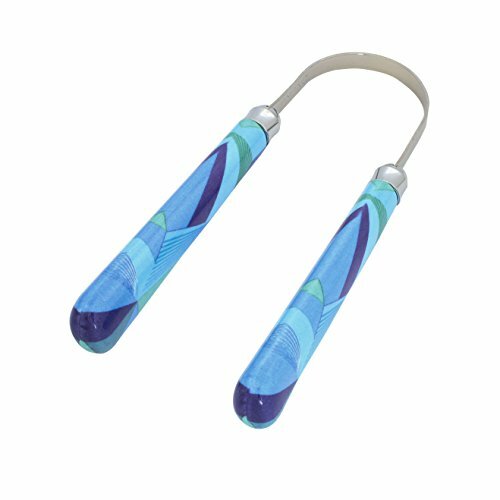 In the list below you find out more about our choice for the best tongue scraper, drTung’s Tongue Cleaner, as well as some other noteworthy choices. Later in the post we also include a buyer’s guide and links to reviews. Having tried the best-selling scrapers and brushes on the market, we found drTung’s (view on Amazon) to offer the best overall experience. Taking into consideration the price, design, and effectiveness of the clean. Currently the 1 pack option is out of stock on Amazon, so we have included a link to the 2 pack, which is in stock. 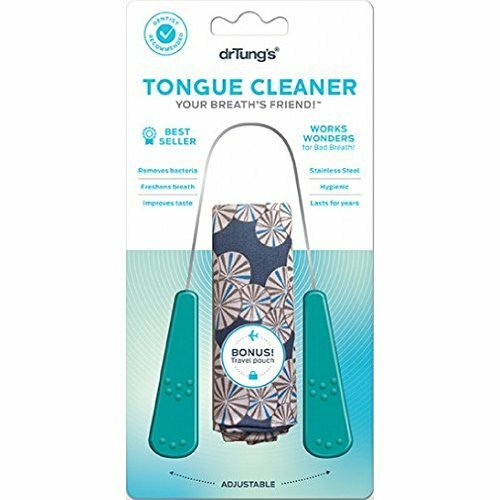 One of the most widely regarded and highest rated tongue cleaners available today, drTung’s tongue cleaner is made from stainless steel and comes nicely packaged and even has a travel pouch included. The handles can be used as grips as you pull the cleaner from the back of the tongue to the front and can be used either one handed or two handed. Two hands gives a little more control. We did not get a choice of coloured rubber grips, but depending on where you buy it you may do. The travel pouch is a really great inclusion to not only protect from damage and dirt when travelling with it but just making it easier to access. The design is perhaps a little feminine and a pouch in one solid colour would have been preferred, but it is the only one of all the scrapers that includes a pouch at all. Priced at around £4.99 at the time of writing, this is not the cheapest, but has potentially a lifetime of use ahead of it. Even if you price it over a couple of years, it works out a lot cheaper than those designed to be replaced every few months. Just because we have rated drTung’s as our choice, need not mean it is the best choice for you. When it comes to having a scraper with style and quality, there is only one that ticks both boxes and that is the Amano tongue cleaner (view on Amazon). This is to the tongue scrapers what Ralph Lauren and Gucci are to the fashion world. I didn’t think a tongue scraper could be so fancy. Packaged in a smart hard plastic case, the scraper is available in a variety of designs to fit your style and preference. There is attention to detail in the design and finish with large easy to hold handles and smart fixings between these and the metal scraper. The head is made of 18/10 Austenitic Steel – a high-grade chromium and nickel alloy that will stand the test of time and delivers an effective cleanse of the tongue with every pass. We go into more detail in our Amano Tongue Cleaner Review. The DenTek Comfort Clean Tongue Cleaner (view on Amazon) is plastic in construction and is certainly softer on the tongue. This is useful if you do not like the harsher scraping provided by the metal options. The head itself covers a large area of the tongue and perhaps would require less repetitive strokes as the 3 scraping edges mimic this in many respects. It does feel a little flimsy and although it is not going to break unless excessive force is used, over time the head may become weaker than the metal alternatives. 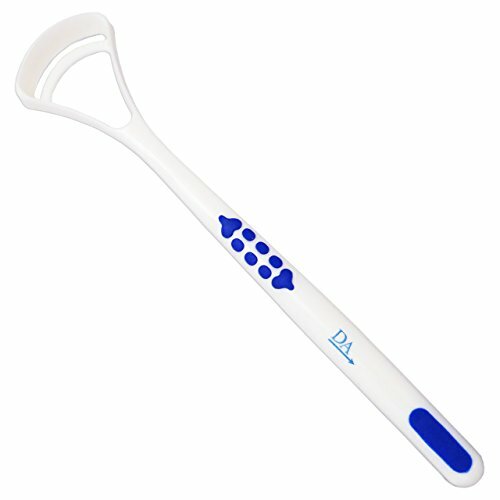 Out of all the scrapers the Orabrush Tongue Cleaner Fresh Breath Brush With Scraper (view on Amazon) won the tickle test. We found it the least comfortable to use initially. The combination of bristles and scraper work well to clean the tongue. With this scraper we had the feeling we had really had put some effort into cleaning our tongue, but the sensation appeared to last longer. The scraper is much like a normal toothbrush, but the head is much wider and there is a different bristle arrangement to normal toothbrushes. Whilst this is certainly feasible, the long term cost certainly makes this a more expensive option compared to the longer lasting options available today. In fact it is more expensive than most manual toothbrushes or electric toothbrush heads. The simplistic nature of the HealthAndYoga scraper (view on Amazon) really won us over. This scraper is an all-metal construction, like drTung’s, and there are nicely rounded handles/grips at the two ends compared to the rubber with drTungs. Whilst the rubber tips are easier to hold onto, especially when wet, the end of the scraper tends not to be too exposed to moisture and as such poses little issue. Made of stainless steel, the packaging clearly labeled this as ‘surgical steel’. The difference? Well truthfully none. It is not clear what grade of metal is used in drTung’s scraper to be able to compare. We would be inclined to believe it is 316 but not marketed in this way. Expecting big things from Wisdom as a fan of their flosser (view on Amazon), the tongue cleaner (view on Amazon) did not exactly disappoint, but it has not wowed us. Despite this we still rank it as one of the best. Smartly packaged, there are clear details on how to make best use of the cleaner and advice to replace it every 3 months for hygiene purposes. Shaped like a manual brush, there is a long plastic handle that for the most part is wrapped in a soft touch rubber/silicone, and then the head is an oval shape with the centre missing. Around the edge are a series of rubber nodules that do the scraping. The nodules are amongst the thickest of all the scrapers, but the overall design and single row of scrapers means it covers a smaller surface area and well it seems an opportunity missed in the middle of the brush head. This scraper offers a very soft cleaning experience, whilst you could feel it scraping certainly did not leave the same just scraped/cleaned feeling and taste that we hoped for. Sporting a minty flavour, whilst it could be smelled, it could not be tasted. The neck of the brush has a real flex to it. It would take a lot to snap or break it but the flex will take out some of the pressure in the clean if putting a lot of pressure on. The most simplistic of the plastic scrapers, the one from Dental Aesthetics (view on Amazon) is also the one that offers the sharpest edge. Although they do also offer a ‘deluxe’ version that has more scrapers. We chose the blue colour rubber grips but you can choose from the options available. Blue was the cheapest at the time of testing. 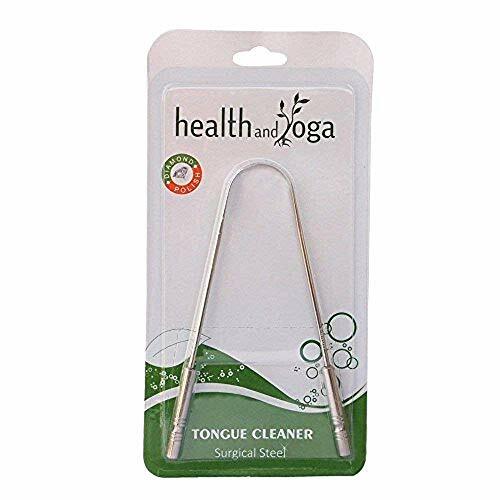 The packaging for the Ayurvedic Tongue Scraper (view on Amazon) is cheap and simple, with ours coming supplied with a card insert that labeled the product. It looked cheesy, dated and unappealing. Not a big issue, but certainly did not win us over. With a bit of delicate handling these could offer better value than the HealthandYoga and drTung’s if you preference is for copper over stainless steel. Although removing the bacteria and food debris from the tongue will help reduce bad breath, there is no evidence that is reduces the risk of dental decay or gum disease. You can read these simple steps in our how to brush your tongue article. 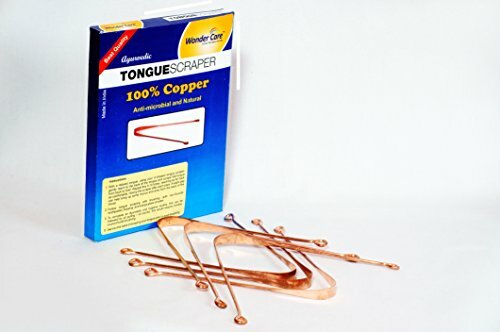 You can purchase tongue scrapers from most good retailers who sell oral healthcare products be that a chemist like Boots, or other beauty outlets like Superdrug, although we found at the time of writing they did not have many options available.